Gardening offers a plethora of health benefits. From breathing in fresh air to absorbing vitamin D from the sun, when you work in the yard, nature works with you. Gardening offers the physical benefits of increased mobility and strength too. It can, however, also bring pain. In fact, while gardening is an activity that most people think of as low-impact, there are many injuries that can occur from weeding and shoveling. Some of the most common gardening-related injuries are neck pain, shoulder tendonitis, low back pain, lateral epicondylitis, carpal tunnel syndrome, de Quervain’s tenosynovitis of the thumb, and prepatellar bursitis. Take heed of the following do’s and don’ts when heading out to the yard. Having the right tool for the job is just as important in gardening as when building a shed. Sometimes a more powerful tool not only speeds up the process, but helps keep your body from taking a beating too. 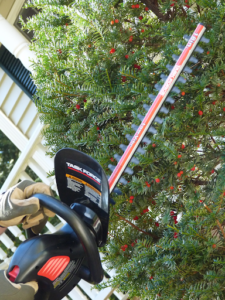 For example, choose a power trimmer for branches and large hedges to minimize the repeated motion and above-the-shoulders work of manual hedge trimmers. Or use a power edger instead of relying on the manual rotary edger. If you aren’t comfortable with power tools, it’s a good time to ask a neighbor, friend, or professional to handle the task. Most electric and gas or battery-powered edgers, mowers, weed eaters and other implements offer necessary adjustments that can make the tool a lot more comfortable, and safer, to use. For example, a trimmer usually has one adjustment to make the handle longer or shorter and another adjustment for the angle of the handle. Use these to your advantage so that you’re not slouching or overreaching. Use a support strap to bear the weight if available. The fact that gardening can be hard on the body is nothing new, so many products have been developed to make the job easier. Work smarter, not harder when it comes to gardening with the help of a garden cart instead of a wheelbarrow for light weeds and bark. 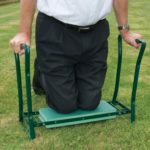 Use a stool while weeding or trimming plants. Cushion your knees with a gardening pad. Much of the issue with gardening is posture related. For example, bending over on your hands and knees adds stress to the lower back. To avoid this, create raised beds for your garden. 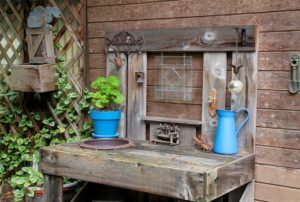 Also, use a potting bench or table to plant flowers and divide plants so you can work at standing height. Avoid yanking and jerking motions when using a shovel or pulling weeds, and use caution when twisting, such as when you shovel bark dust from the yard cart to the flower bed. Be sure to change activities frequently. Spend 20 minutes pulling weeds, then move to an upright activity like pruning the roses. Then move on to mowing or shoveling. 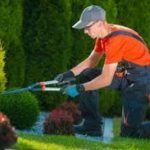 Aim to work on three different types of yard work per hour or break between sessions. Back injuries are a common result of yard work so use extra caution. Avoid bending straight over at the waist. Instead, bend at the knees when you lower to the ground. To help prevent repetitive motion injuries and all of the “itis” ailments that come from inflaming one area of the body, be sure to switch from one hand to the other while digging or handling the weed eater. If you’re moving gravel, shovel from right to left and then shovel left to right for a while. Focus on using both sides of the body to alleviate repetition on muscle groups. One wrong lift can cause big problems. We seem to use proper lifting techniques when we expect an item to be heavy, but often injury comes from poor lifting practices even when the item is light. Always bend the knees when lifting. Pull your navel in slightly as you rise. Use gloves to protect your hands. Get a partner for awkward or heavy items. Most of all, know and respect your limits. Gardening should be an enjoyable experience. Get the job done with the right tools and proper techniques so your yard and your body will thank you. Your hands ache, your thumb screams when you move it, your forearms feel stiff, or there’s that spot on your back that doesn’t ever seem to loosen up. You may be suffering from a repetitive motion injury. Also known as tendonitis, repetitive motion injuries (RMI) are temporary or permanent injuries caused by making the same motions over and over again. Carpal tunnel syndrome is a well-publicized example, but an injury to muscles, nerves, ligaments, and tendons can occur nearly anywhere in the body. RMIs can be excruciatingly painful and debilitating. If your doctor has diagnosed an RMI, it’s essential to create a game plan to deal with it as soon as possible. While it can be a chronic condition, many RMIs can be alleviated with patience, proper care, and a change in your habits. RMIs are very common in the smaller ligaments and tendons because they can’t sustain the abuse that some larger muscle groups can. We know that we should lift with the legs to protect the back, and understand that curling heavy weights could damage the bicep, but we often don’t think about the little guys that offer support to our skeletal system throughout our everyday activities. Therefore, we often don’t take preventative measures to protect them. To help prevent injury you must first identify repetitive motions. If you golf, think about your hand grip. 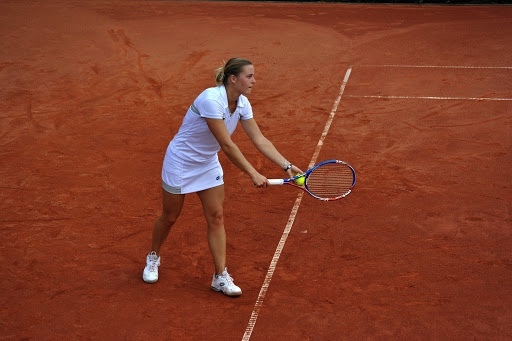 For tennis players, well, they call it tennis elbow for a reason. And of course, for those of you saddled up to a computer keyboard, think about how your hands, wrists, and forearms feel after a day on the job. Whatever your repetitive motion is, create an alternative. For example, vary your keyboard usage, employing a wrist rest and then taking it away for short periods; allowing different muscles to carry the load. Alternately, consider a talk-to-type program and avoid typing altogether. A visit with an occupational therapist can help you find out about ergonomic solutions that might be available to you on the job or during recreational activities. 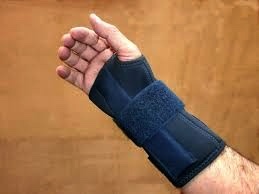 Most doctors will recommend a brace for the afflicted area, which helps to immobilize it so that it can heal. Inflammation in the area will remain and worsen with continued use, so it is essential to act quickly for the best chance of recovery. While there are generic splints available at medical supply stores for nearly every part of the body, the most effective braces are made by specialists who create a custom design specifically for you. As much as you might hate it, rest and relaxation is required to allow your body to heal. Continuing to push past the pain, ignore the issue, or only half-heartedly adhering to a treatment regimen could result in permanent damage. This likely means stepping away from some of your favorite activities to focus on your recovery. In addition to resting the afflicted area, the first line of defense typically includes heat and cold treatments, alternating as prescribed. In addition, you will probably be asked to take regular doses of ibuprofen, Naproxen, or other anti-inflammatories. One of the most important things you can do preventatively or as a treatment for an RMI is to stretch. Target stretches specific to your condition and perform them frequently; it helps your muscles from tightening up. If you don’t know which stretches could help, look to your physical therapist for a plan. Along with stretching, conditioning exercises can help improve the situation and prevent further injury. There are more than three million cases of RMI diagnosed each year, with many more likely undiagnosed cases as well. RMI as a chronic condition can cause depression, anxiety, and perhaps even force a change of job or lifestyle so it is essential to reach out for any professional help you might need to treat the condition. The good news is that with a proper diagnosis and combination of treatments, improvement is highly likely. New year, new goals. Some call them resolutions while others refer to them as objectives. However you label your targeted aspirations for the year, it’s likely that they include some form of exercise and health regimen. Whether your aim is to hit the gym x days per week, increase your endurance, become more flexible, or join a regular class, it’s important to consider potential obstacles in the way of that goal. 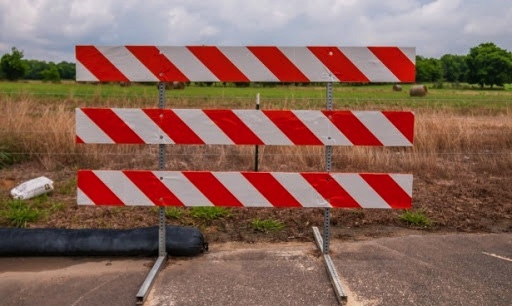 Identifying roadblocks up front will increase your chances for long-term success. Muscular or skeletal pain is one of the top reasons for doctor visits. It’s so common that there are specialists for nearly every body part that experiences pain; hand specialists, podiatrists, rheumatologists, and physical therapists are a few examples. 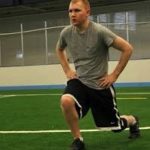 Any type of pain during movement can be a serious demotivator when it comes to working out, but don’t let it derail your efforts. Instead, take steps to face the problem and create an exercise plan that works for you. Sometimes moving with pain becomes such a normal part of our day that we don’t stop to think about it. Now is the perfect time to pause to evaluate where you feel the pain and identify activities that make it worse. For example, is your knee pain exacerbated during squats or is it worse when you stand in one place too long? Do you have constant pain in your outer elbow, inside your wrist, or along your thumb? Does your lower back ache more after a car ride or a run? Keep a journal of your activity and record when your pain is the worst. This will help you identify which activities cause a flare up. Your physical therapist sees repetitive motion ailments day in and day out so he or she can also help guide you in the right direction. Now that you’ve taken the time to better evaluate the location of your pain and the activities that inflame it, take the information to your physical therapist or doctor. He or she may be able to quickly identify the problem or refer you to another professional for diagnostics. Once your diagnosis has been identified, you can begin to formulate a game plan that will help you treat the issue so you can ‘get back in the game’. With a diagnosis in hand, align your objectives with that in mind. Working along with your condition rather than just trying to work through it will set you up to achieve your goals. Dealing with arthritis in your hand, for example, makes it challenging to lift heavy weights so weight machines that aid movement might be a better option. If you struggle with hypermobility, you might want to take a strength training class rather than yoga. On the other hand, yoga might be the perfect fit if your doctor has advised against high-impact activities such as skiing or running. Your physical therapist is a great resource when developing these types of plans. Part of the reason to set goals is to motivate yourself to try new things or achieve higher levels of fitness. Whether you plan to take up tennis for the first time or hope to finally hold a plank for a full two minutes, increasing performance is a worthy goal. Sometimes your efforts are hampered by physical restrictions other than pain, such as shortened tendons or overly tight muscles. 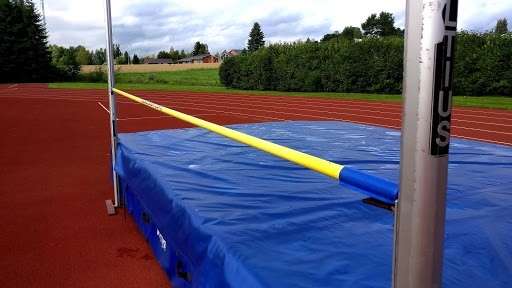 If improved sports performance is your goal, look into ways to correct your form, increase flexibility, or take your jumps to a new height. Physical therapy is an effective tool to help you understand the movements of your body and learn how to get a larger range of motion or increased stability and center of balance. Wherever you are on your wellness journey, be realistic in setting your goals. Meet your body where it’s at by identifying issues, getting a diagnosis, and creating a plan that works within the boundaries suggested by your doctor and physical therapist. The Centers for Disease Control and Prevention (CDC) reports that the various forms of arthritis affect more than 54.4 million American adults and that number is expected to rise to 78 million in the next 20 years. Due to its prevalent nature, it’s a topic that touches nearly every household in the country and begs a deeper understanding to improve prevention, diagnosis, and treatment options. Arthritis is the inflammation and swelling of the joints related to degradation of the cartilage between joints, or irritation to the joint lining and surrounding tissues. When the normally-slippery cartilage cushion between joints wears down, it no longer offers fluid movement so the joints feel stiff, like they are working harder, which they are. In severe arthritis, the bare joints actually rub together causing pain in addition to stiffness. Although arthritis is common as we age, there are other causes of joint pain and stiffness so you should always seek a diagnosis from your doctor through x-rays and other tests. Within the definition of arthritis it is important to distinguish between two main forms of the ailment. Osteoarthritis is the type of arthritis described above, consistent with degeneration of the cartilage between joints. It does not have a cure and cannot be reversed. Osteoarthritis progressively worsens with age and is most commonly seen in the hands, knees, and hips. 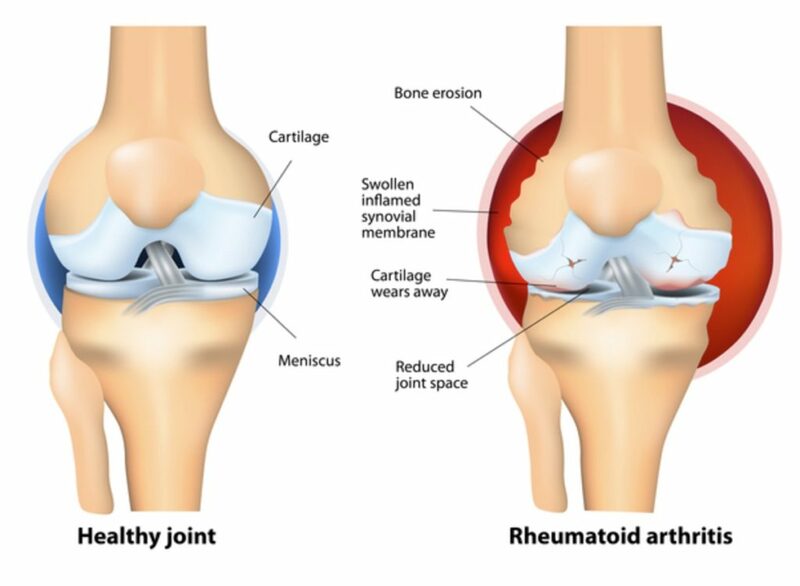 In contrast to the mechanical or functional causes of osteoarthritis, rheumatoid arthritis (RA) is caused by inflammation. This inflammation is a response to the body’s blood cells attacking the area, similar to an allergic reaction. Doctor’s do not currently understand what causes this attack in some patients. Overall, the incidence of RA is a small percentage of cases, with osteoarthritis being significantly more common. RA begins with pain, stiffness, and swelling as the lining of the joints become inflamed, and progressively worsens. Over time, the joint and bones can become damaged so it is important to recognize RA and seek treatment as early as possible for better long-term results. Another important aspect of arthritis is that it has the potential to affect systems within the body besides the joints and surrounding areas. Because those who suffer from arthritis have inflammation in the body, risks of cardiovascular disease, heart attack, stroke, congestive heart failure, vascular disease, atherosclerosis, and osteoporosis are all increased, further emphasizing the need for early detection and treatment. Both types of arthritis can be treated with medications. RA medications aim to reduce inflammation within the body while Osteoarthritis treatment focuses more on pain management. Consistent and safe movement is another prescription for arthritis relief. The pain of arthritis stems from joints and bones moving inefficiently due to inflammation and degeneration of the lubricating cushions between them. While some medications can help with the pain and swelling related to arthritis, physical therapy is an added step that can provide relief. Through physical therapy the patient learns what exercises increase fluid movement between the joints while limiting any potentially harmful impact. In addition to increasing mobility in the joints, and subsequently for the patient, physical therapy also strengthens joints impaired by arthritis and helps protect against further damage. If you are one of many that is being affected by arthritis, call Encore Physical Therapy to see how we can help. Easy Exercises You Can Do Anywhere! With nearly every newspaper headline, magazine cover, and internet webpage we are inundated with reminders about the importance of exercise. “Beat Diabetes!” “Add Ten Years to Your Life,” “Reverse Chronic Pain,” etc. Those headlines sell because we all know how important exercise is for our general health as well as mental well-being. 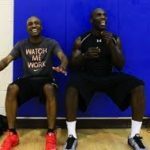 It’s one thing to intend to hit the gym five days each week, but implementing that goal is a completely different beast. After all, intentions only go so far. Life gets in the way. So we’re here to help you transform those plans into actions. Whether you’re waiting in line for coffee, picking up the kids from school, on a road trip, or trapped at your desk, here are some easy exercises you can do anywhere! You’ve probably performed the cat and cow poses while participating in hot yoga (or maybe just watched it on TV while downing a pint of Ben and Jerry’s), but it’s not always convenient to drop to your hands and knees for an arch and dip of the spine. Instead, try it from a seated position. Even if you’re crammed into economy seating on a plane you can manage a handful of these. Simply scoot forward to the edge of your chair. Make sure your feet are planted and your core is tight. Arch your back into a “cow” position allowing it to curve from your tailbone to the top of your head. Then reverse the position, tucking your chin and pulling your navel into your spine to create an arch. Repeat several times to release tension up the spine and through the neck. Whether you spend your days in heels or sloshing around in rubber boots, your calf muscles can tend to tighten, potentially causing problems up and down your body. That’s no fun. Keep your calf muscles elastic and ready for action with frequent use. When you find yourself waiting in line, start in with the heel lifts. These are most effective with your toes on a small platform or stair, but even without the elevation your calves will thank you for the workout. Simply rise up onto your toes, lifting your heels as high as you can with each repetition. If that isn’t challenging enough, try doing it one foot at a time. If you’re a mother you’ve undoubtedly been told about Kegels. But, strong pelvic floor muscles do more than just support the weight of baby during pregnancy. They help with bladder control (no more crossing your legs when you sneeze) and also rectal control. “Squeeze” in a few kegels at red lights, in the coffee drive through, or when you’re dozing off during the partner’s meeting. They are easy to do and no one will even know! Lift your pelvic floor muscles into a tightened position, hold a few seconds, and release. Repeat several times. To give you an idea of what it should feel like, these are the same muscles you use when you stop a stream of urine. Remember to target those muscles while keeping the rest of your body relaxed. Also breathe naturally instead of holding your breath. Need to go talk to the neighbor upstairs? Is your office on the third floor? Visiting a friend in the hospital? Take the stairs. Not only does stair climbing work a variety of muscles from your calves to your core, but it increases your cardiovascular endurance as well. When you’re headed to the kitchen for your morning coffee, take big steps, drop your back knee and lunge–each step of the way. Lunges work most of the muscles in your lower extremities which creates high impact with only a few movements. Keep your core tight to support your back and hips during your lunges. Waiting for the conditioner to do its thing while in the shower? Brushing your teeth? On the phone with a vendor? Anytime is a good time to crank out some squats. Use proper form with a tight core as you bend your knees into a seated position. Make sure you focus on sitting back so your knees don’t extend past the tips of your toes. Hold this pose or repeat several times, varying your tempo. Standing in place, balance on one leg and draw your other knee up, pulling it towards your chest. Hug your knee for a deep stretch and change legs. Lean your straight-leg hip slightly against your desk or file cabinet for stability if needed. Forming a seated position, press your back against the wall. Hold as long as you can to engage your core and strengthen your legs. You can do this while you talk on the phone or during your child’s gymnastic practice. Strengthen the back of your arms with the traditional tricep dip. Simply find a surface such as a counter or desk. Turn your back to it with your hands placed on top of it. Bend your elbows, pushing them away from you and push yourself back up using your triceps. You’ve probably done these on the ground from a push-up position during P.E. or other sports warm-up. You can take the same idea and use it at the office or home as a quick way to get the blood flowing. Begin with your feet placed several feet from the wall. Lean forward and place your hands on the wall. Now perform push-ups. This can also be done on a surface such as a desk. To invite your core to the party, lift each knee in a high-knee march while in the push-up position against the wall. Alternately, or in conjunction, cross the knee in front of your body as you lift it. Sitting all day is rough on a body. To avoid the spine slouch make sure you keep your tummy muscles working. Even at a desk or in front of the TV, you can achieve this with a seated reverse crunch. Begin by sitting near the edge of your chair with a straight posture. Extend your legs with both heels on the ground. Support your back if needed and pull your knees up towards your chest using your lower abdominal muscles. Repeat several times a few times each day. Maintaining optimal health is a multi-faceted effort. It requires attention to your diet, sleep, medications, and of course your level of activity. Help your body help you by moving whenever and wherever you are, even if that means during the 16-hour work day or 2-hour commute.